It’s an interesting mix of Lake Conference and Suburban East Conference programs vying for the Section 3AA title. The rival conferences each placed two teams among the top four seeds in what should be a fun race to the X.
Top-seeded Eagan (20-4-1) made a great – and unexpected – run at the Lake Conference title this winter, eventually tying for second place with Burnsville. It’s not that the Wildcats didn’t have talent, but they were a very young team that was expected to be a year away from true contention. But the kids grew up quickly. Eagan raced out of the gates with an 11-0-1 start in its first 12 games against high school competition (mixed in was a 5-3 loss to the U.S. Women’s Olympic) and quickly made itself known as a contender. The Wildcats have been stingy, allowing just 2.12 goals per game. In each of their past four games, Eagan has given up exactly one goal. Junior Tommy Bodecker has been a revelation in goal, taking over for graduated All-Lake netminder Trent Caspar. No. 2 Cretin-Derham Hall (18-7-0) is the defending section champion, but also had to replace the goaltender that brought it to state last winter, Ben Walsh. Joe Schneider has been solid between the pipes, but it’s the top line of Jesse Perron, Tony Barbato and Bob Kinne that really makes the Raiders go. The trio has combined for 60 of the Raiders’ 101 goals and has been tabbed by coach Jim O’Neill as potentially one of the best he’s ever coached. A 4-2 loss to Cretin in the season finale not only dropped Woodbury (15-8-2) into a three-way tie for the Suburban East Conference crown, but also pushed Cretin past the Royals for the No. 2 seed. No matter in the overall scheme, though. Should both teams win in the quarterfinals as expected, they’ll get a neutral site rematch at the State Fairgrounds Coliseum in the semifinals. Sitting in the No. 4 position is a dangerous Apple Valley (14-11-0) team that finished in the middle of the pack of the Lake Conference. Last year, the Eagles upset the No. 1 seed in the section and will get that chance again should they get past No. 5 Hastings in the quarterfinals. How to pick between Cretin’s line of Jesse Perron, Tony Barbato and Bob Kinne? The trio has nearly identical stats and all are responsible for leading the Raiders to the No. 2 seed. Perron is the lone senior, while Kinne and Barbato are both just juniors. They’re not physically imposing, but they know what to do with the puck. 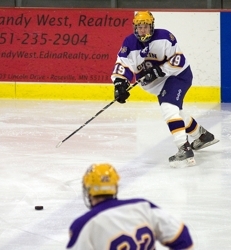 It’s the most balanced line in the section and could push Cretin back to state. 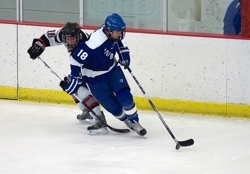 University of Minnesota-bound defenseman Mark Alt adds a big body to the blue line, as well. Apple Valley has an interesting mix of veterans such Chris Fischer and young guns such as freshman Hudson Fasching and sophomore A.J. Michaelson. Woodbury’s Max Gaede is a terrific all-around, hard-nosed player who has committed to Minnesota State. But it could all come down to goaltending. Woodbury’s Michael Ness is the most experienced netminder of the top contenders and has been in the playoff meat-grinder before. Eagan’s Tommy Bodeker has been the best goalie in the section through the regular season and was a key to the Wildcats’ surprising season. Joe Schneider has taken over at Cretin-Derham Hall and responded with a good season. This will be the first playoff run for both Bodecker and Schneider, which may come into play. There isn’t much in Eagan’s resume that suggests they aren’t capable of completing a run to the state tournament. The Wildcats have won 20 games with a tough Lake Conference schedule, sport playoff-style defense and goaltending and have balanced scoring among their top players. Other than inexperience in big playoff games, the Wildcats look like a solid favorite. The No. 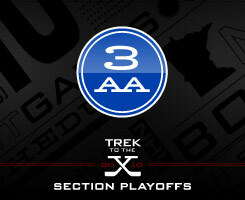 4 Eagles just took top-seeded Eagan to overtime last week before falling, 2-1. Apple Valley has had its ups and downs, but has plenty of young talent that could come together at section time. Assuming they can get past No. 5 Hastings in the quarterfinals, a rematch with Eagan likely awaits in the semifinals.